Accurately finds cable length, impediments in the cable and conditions at the end of every wire in your data, power, or communications/video system up to 3,000 ft. With the complexity of today’s electrical, data, voice and video signal carrying systems, you need a tool that is fast, accurate and easy to use to see down the wire and show the exact conditions that exist. Snap Shot is that tool. 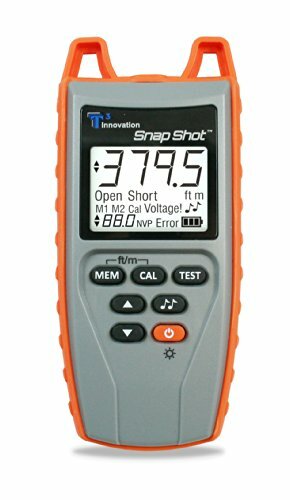 Made in America with American technology, Snap Shot is the new 21st century tool for testing every type of cable in any industry. Advanced Spread Spectrum TDR technology works in all wire environments and is immune to voltage, current, or data stream disruptions. See the true picture of your wiring and cable systems with Snap Shot today. The Snap Shot has the unique ability of calibrating any cable NVP value and using the unit’s internal memory to store up to 2 of your most used cable NVP values. The large backlit LCD screen makes for easy viewing of results in all lighting conditions and the battery life is optimized with an auto power-off feature. On top of all of this the Snap Shot is designed and built in the USA. If you have any questions about this product by T3 Innovation, contact us by completing and submitting the form below. If you are looking for a specif part number, please include it with your message.